I just found out that PdaNet, a popular Android application for tethering without root privileges, is free and with no usage restrictions for anyone outside of the US and Canada! Previously, the free version wouldn't allow SSL connections, and the non-free version was $30US, which is too expensive for me. PdaNet is completely free for users outside of US and Canada. The free/trial edition already contains all the features and will not expire. Please install "PdaNet Free Edition" directly from Android Market. And the new version "now allows you to hide tether usage," according to the PdaNet site, but this requires use of their PC client for connecting, and this feature is only built-in to the windows version. So here's what I did to connect a Mac to a Sony Ericsson Xperia X10 running Android 2.1 using Bluetooth DUN. I prefer using what is natively included with my OS, rather than install random software, especially when it is going to make changes to network interfaces, so I did not install the PdaNet client for Mac. 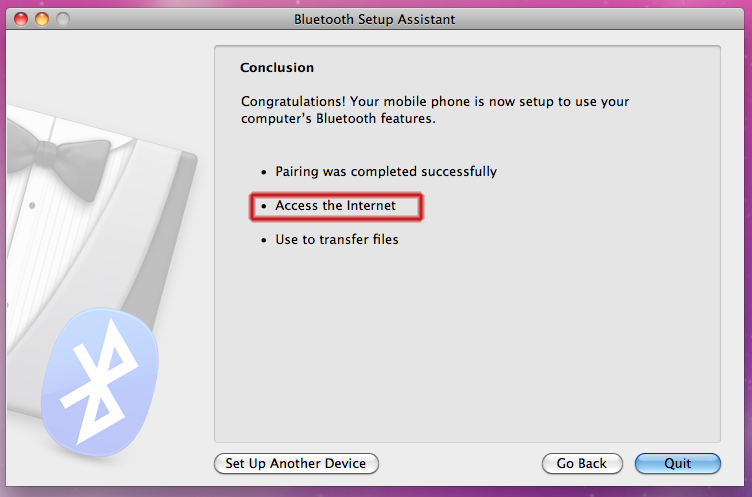 This means that I do not have the option for USB tethering, only bluetooth DUN. Disclaimer: Tethering may be in violation of your mobile carrier's terms of service. 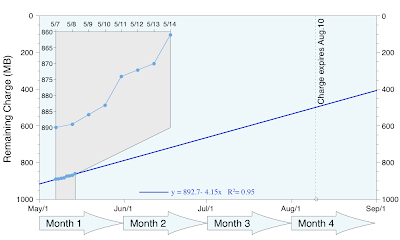 Users of capped data plans should be aware that a computer generally consumes more bandwidth than a cell phone even when doing the same activities. In general bluetooth is flakey as all hell and this may or may not work for you at first or at all, or only after multiple attempts at pairing and rebooting, or it could just stop working one day for no apparent reason. You've been warned. It goes without saying that a similar procedure should work with your favorite flavor of linux. Install PdaNet Free Edition from the Android Market. 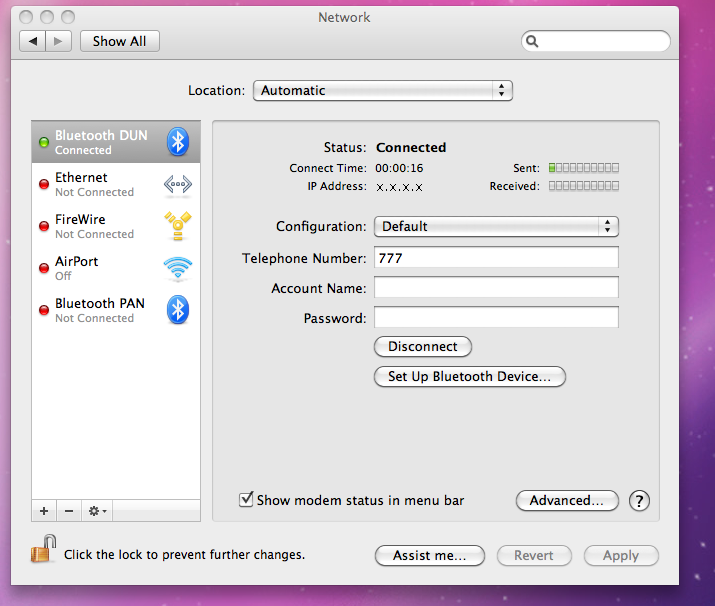 Turn on bluetooth on the Mac and the handset and make each discoverable. Do not yet pair them. 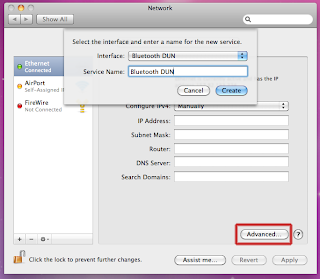 Start PdaNet and "Enable Bluetooth DUN"
Open System Preferences, select the Network pane, and click the plus (+) to add a new network interface. Choose Bluetooth DUN and call it whatever you like. Hit Create. Now looking at the newly created Bluetooth DUN interface, click "Set Up Bluetooth Device..." and follow the instructions for pairing, which I'll skip here. 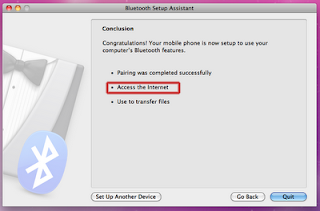 Confirm that when pairing is complete that "Access the Internet" or perhaps something similar depending on your OS version, is displayed as a service. 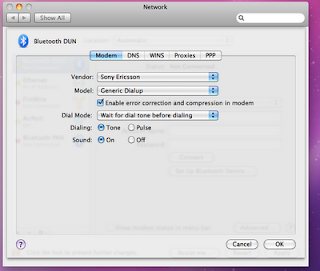 If it is not, PdaNet will not work; reconfirm that PdaNet Bluetooth DUN is enabled and try to pair again. Reboot and turn stuff off and on if you think it will help. Light some incense. Whatever. 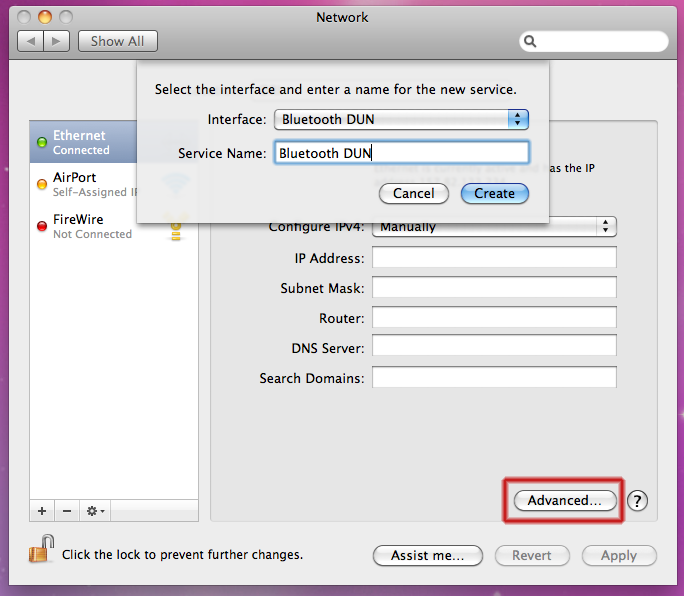 Return to the Network preferences window and click advanced to set up the Bluetooth DUN connection. 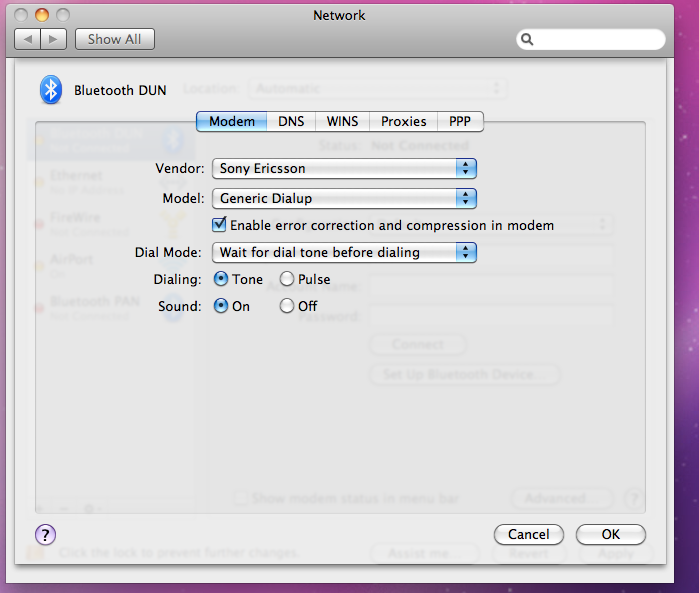 I chose Sony Ericsson as the vendor (though I don't think this really matters) and "Generic Dialup" as the Model. Everything else I left as default. In the main window, enter 777 (not 123 like I've seen elsewhere) for the telephone number, leaving Account Name and Password blank. 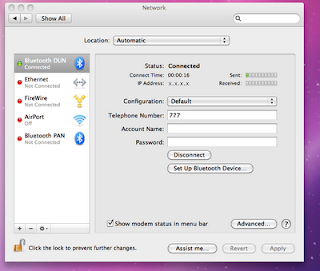 Here is a snippet of my Mac's log where I connected to PdaNet Bluetooth DUN for about a minute before disconnecting. The disconnect script appeared to have hung, though I admittedly only let it go for 45 seconds before I unceremoniously changed to a different network location at exactly 18:27:00. May 31 18:25:22 SBSnote configd: network configuration changed. May 31 18:25:22 SBSnote configd: SCNCController: Connected. May 31 18:26:13 SBSnote configd: network configuration changed. May 31 18:26:13 SBSnote pppd: Connection terminated. This PDF and a FAQ on the mobile Suica site (both Japanese) have more details. 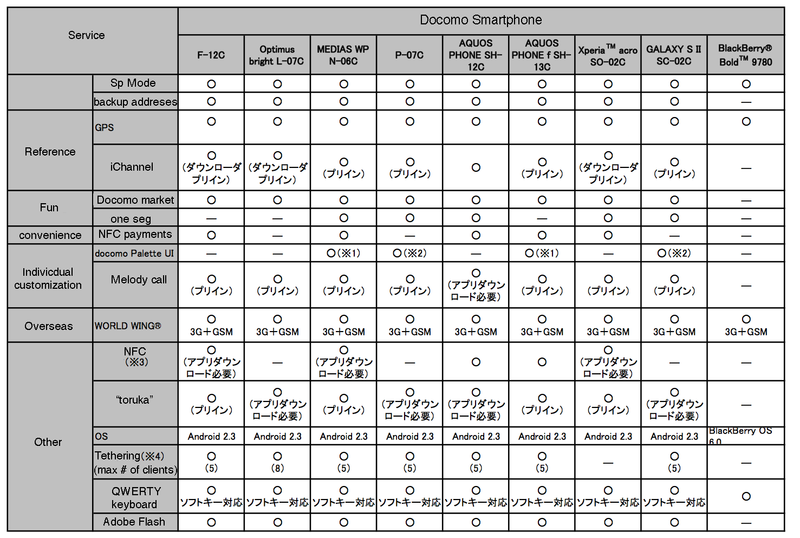 (See this post for a list of Docomo phones that have support). In late June, JR East will release more details regarding specific phone models that are officially supported. I don't know why the carrier matters, by the way. It would seem to me that if 1) the hardware supports it, 2) you have a mobile suica account, and 3) installed the app, it should work. Apparently this is not the case, though. No news on a pasmo app for Tokyo subways and private lines. A feature phone mobile pasmo app does not exist. 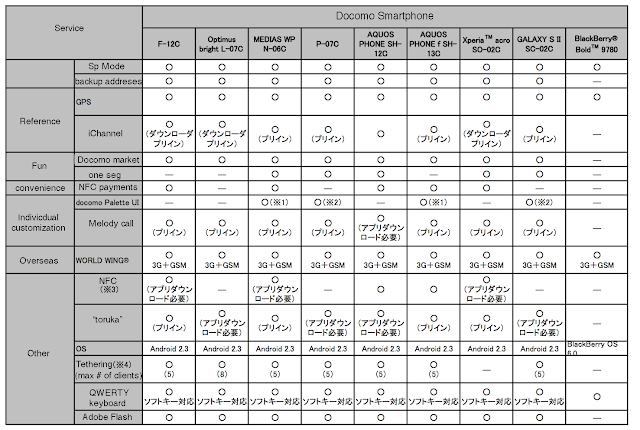 Docomo announced their Summer lineup today, with 24 models in total, eight of which are Androids. These are the phones that will be eligible for unlocking. All Android handsets have 2.3 Gingerbread. All Androids (except P-07C and Optimus) support Highspeed 14 Mbps downlink. 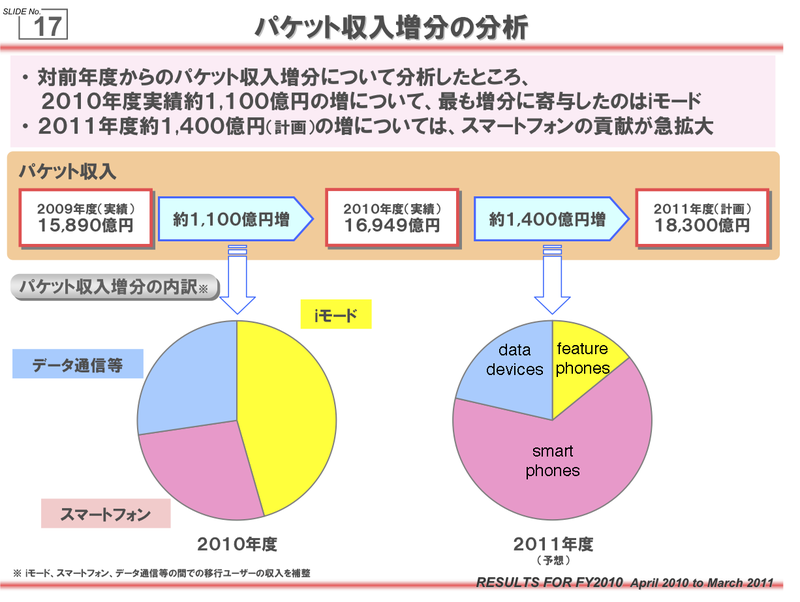 All Androids except Xperia acro SO-02C support tethering but for over ¥10,000 per month. There are two Xi LTE wireless routers. It's good to see that there are no stragglers with Froyo or Eclair installed on the Androids. The inclusion of a proprietary Docomo UI sets of warning alarms - please don't "differentiate" your products. The phones will be rolling out from 5/20 with the Aquos SH-12C, Optimus in mid June, Galaxy (dual core!) in late June, Medias and Xperia between June and July, and the rest from July/August. In a nutshell, tethering still makes no sense as implemented by Docomo. First off, if you are tethering from a tablet that you purchased from Docomo, or an unlocked smartphone that you brought to Docomo but only activated as a data device, you get the normal flat rate. These devices use a "FOMA Data Plan" and connect through the data-only APNs. However, to activate tethering on a smartphone, you won't be able to do it on the standard packet houdai plan APN. It sounds like you will use the sp-mode APN, or perhaps switch to the mopera.net APN, any connection to automatically adds ¥4,200 to your monthly bill. Either way, the cost for "connecting a computer or other external device" (パソコンなどの外部機器を接続した通信) is ¥4,200. This fee is non-negotiable and non-removable, trust me. While I think it is fair for customers to pay for the services they use, charging such a high price to tether a device based solely on whether or not it is voice capable is just plain dumb. As such, my recommendation for tethering is using a Docomo-branded smartphone that has been rooted to allow activation of tethering through the mpr2.bizho.net APN. While this could change without warning, there is no indication that Docomo is currently looking for people who are tethering in this way. 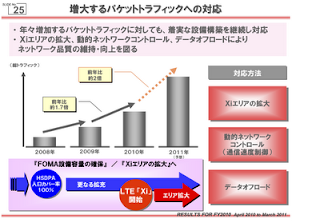 Many watching Docomo lately are scratching their heads in bemusement at how Docomo is handling tethering. I was commenting to a friend last week how it reminds me of some kids I met 10 years ago in the Australian bush. These kids always chased kangaroos. I asked why. They said it's just what they do. I asked what they'd do if they ever actually caught one. They looked at me with blank stares, which is the look I'm getting from Docomo with respect to SIM unlocking. Now that they got it, they have no idea what to actually do with it. I'm sure they'll figure out it, though... Sometime. The below graph is from here (J). There is another graph that has screen resolutions and other dimensions here. 3: NFC on non-SH models requires an application planned for release around summer 2011. 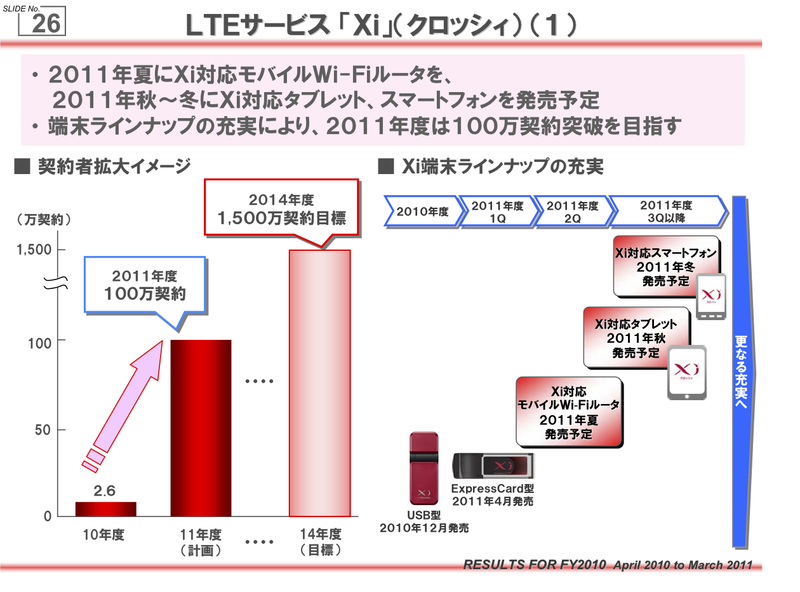 Docomo's FY2010 end of year report (PDF) includes some more information on LTE plans for this year. Docomo has seen a steady year over year increase in data traffic and is projecting a doubling during 2011. 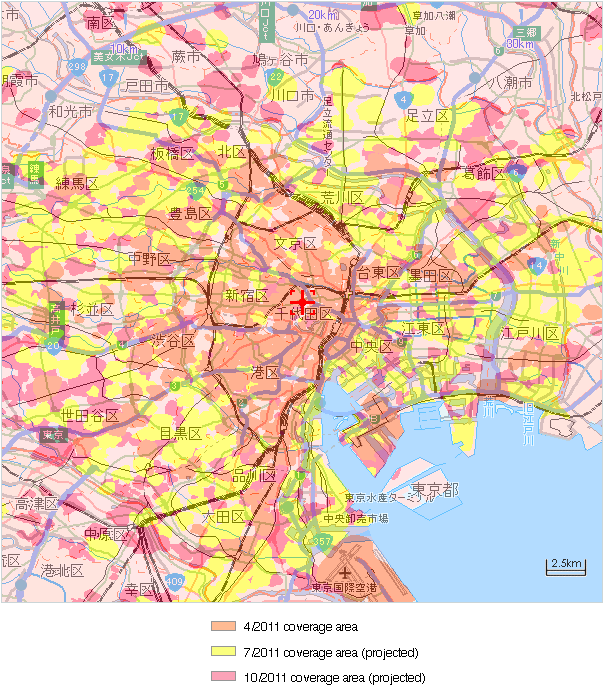 Docomo plans for increased demand to be partially offset by increased Xi coverage, which will improve overall network quality due to the dynamic network controls and data offloading provided by LTE. Somewhat interestingly, however, is that projected revenue from data in 2011is to come overwhelming from smartphones, primarily at the expense of feature phones, rather than from data devices. Since only one LTE handset is in the works so far, and the Spring 2012 models would hardly contribute to FY2011 earnings at all, it would seem that most of this revenue would be coming from FOMA 3G smartphones. This means the network enhancements that LTE brings to the game, as mentioned above, would be not have so much of an effect on improving network quality. To be fair, though, Docomo's network seems robust enough to handle the extra traffic. 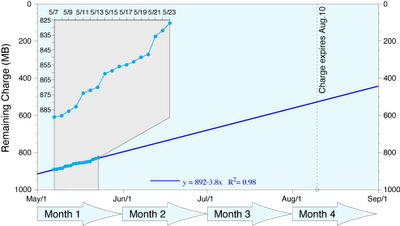 Of course revenue does not necessarily scale linearly with the number of consumed data packets; there most certainly will be heavy discounts offered to customers who sign 2 year Xi contracts. Also, I am assuming that bandwidth consumed by non-voice enabled tablets is not included in the smartphone category but rather in the data device category (based on the APN and service plan required for these tablets). 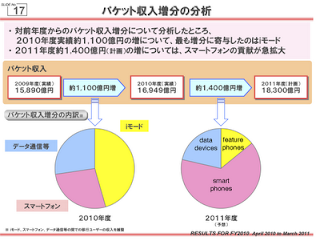 Since rolling out service in December 2010, Docomo has amassed only 26,000 subscribers but is aiming to raise that to one million by the end of FY2011. 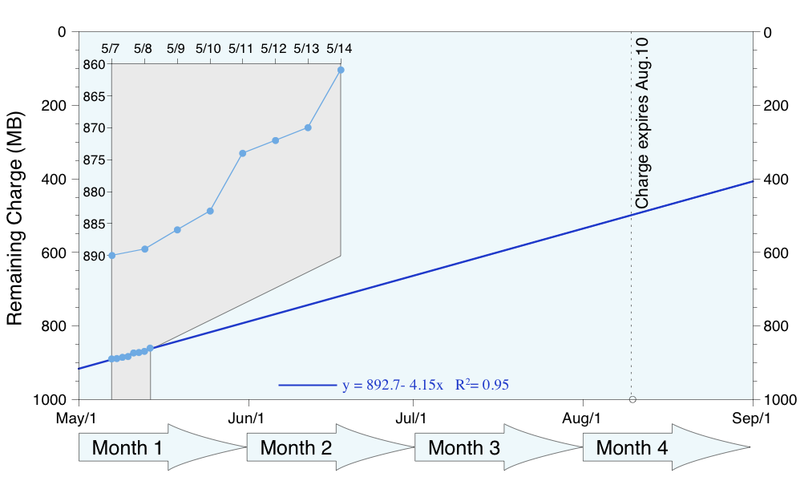 Growth is then projected to slow with only 1.5 million subscribers by 2014. The slow addition of customers so far is certainly related to the lackluster product offering, which is limited to a USB and an ExpressCard dongle. Planned for release this year are a router in summer, followed by a (Fujitsu?) tablet this fall, and finally a (Samsung?) smartphone in winter. (brands via juggly). By April 2011, there were approximately 1,100 Xi base stations covering around 8% of the population. By July 2011, service is planned for roll out in Sapporo, Sendai, Kanazawa, Takamatsu, Hiroshima, and Fukuoka. By April 2012, coverage is expected to grow to 20% with a total of 5,000 stations this year. A word of warning to those eagerly awaiting the start of service. Note the patchiness in Tokyo at the moment. While less urban areas would be easier to blanket, be certain to confirm that you are in a coverage area before signing up. 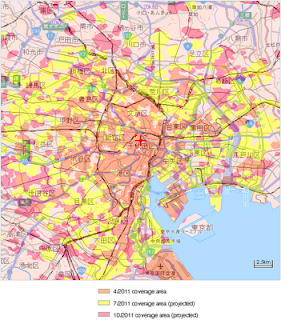 Finally, two words on the potential problem of interference with GPS in Japan: No Problem. A few more words. LightSquared has tentative approval from the United States FCC to build a wholesale LTE network using a ~ 1500 MHz frequency that is directly adjacent to a band used by GPS. US GPS manufacturer Garmin tested the proposed system in the lab (PDF) and determined that it will create significant interference. A representative car navigation system began to be jammed at a power level equivalent to an approximately 6 km distance from a single tower, with complete loss of signal at around 3 km and 1 km in urban and open areas, respectively. In the US, the issue arrises from the repurposing of a band originally not intended for relatively high-power terrestrial transmissions. Docomo, as far as I can tell, is using a different 1500 MHz band that was set aside for cellular use, band 21 that doesn't interfere with GPS signals. Besides, given the coverage map above, we'd know already if jamming was an issue. Obviously it is not (in Japan). EDITED to reflect that the saving would be on my Docomo bill but not reflect the amount I paid to B-mobile. I previously posted that, based on my actual data usage over the past year and half, using a B-mobile Fair SIM would have cost me about half of what I've paid to Docomo for my smartphone data plan. Now it's time for a real world test, so I'm going cold turkey on my Docomo paket houdai data plan. I've disable data on my Docomo ht-03a and will be using that handset for voice only. For data, I will also be carrying around a Nexus One with a B-mobile Fair SIM. I will do this until I exhaust the prepaid 1000 MBs, or until August 10, 2011, which ever comes first. The charge on the SIM is currently 890 MB that expires on August 10th. The test will start from today, May 7th. While it would be preferable to start this test with exactly 4 months and 1000 MB, I used about 100 MB in mid April testing the SIM with skype, etc. Having to carry two handsets is not exactly ideal, but since I am subscribed to Docmo's two-tiered packet-houdai data plan, I have incentive not to use my Docomo handset for data, since I will actually save money if I don't. The MyDocomo site tells me that I have used zero packets so far in May and have only incurred the minimum charge of ¥372 for data so far. (This is because I was out of Japan during Golden Week.) If the B-mobile Fair SIM lasts me for all of May, June, and July, that would be a savings of over ¥15,000 (off my Docomo bill), since this would encompass three full billing cycles. Turned off picasa web album syncing. The most significant change I will make is using wifi when available. I purposely don't use wifi now simply because it is a drain on my battery, even though I could use it at home and at work. installed superuser from the market to control which apps can invoke su. installed busybox from the market because it is a dependency for many apps that require root. I am not aware of any way of rooting the N1 with Gingerbread without unlocking the bootloader. There is no need to use any exploit apps.